Objective: We need to show goodness to everyone. What were the names of the people in the story? How was Ruth good to Naomi? Math: Sorting by shape – circle, rectangle, etc. Information: Place in order the numbers of your home phone. - Samaritan’s Purse is an organization that provides a gift-filled shoebox to children all over the world through Operation Christmas Child. Choosing items to fill the shoebox is an excellent way for your child to share goodness. This also puts into practice the true meaning of Christmas. - Paint the Ruth Gathering Grain worksheet with grass or leaves. 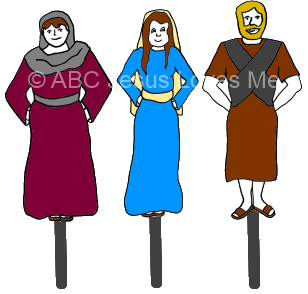 - ABCJLM Bible Workbook: Using the Ruth, Naomi, Boaz Puppets worksheet, color and tape each character to a craft stick. Have the child tell the story using the puppets. You may also back each with sandpaper or flannel to use with a flannelgraph board. - Sort various items by shape. May use various sized small containers and lids or have your child help empty the dishwasher. Assist her in sorting things on a low table or cabinet if she cannot reach to put the items away. Always have your child explain to you why she sorted the items in their chosen piles. Week 11 focuses on "A" from the second group of "angled-line letters." Start by creating the characters using short and long craft sticks and move to writing the characters on the Angled Line Characters #2 worksheet to show the progression of the letters and numbers. Gather three popsicle sticks and instruct the child to make a triangle. Create an "A" by moving the bottom stick up. Continue the activity by making an "A" and saying "A" and then moving the stick down and saying "triangle." 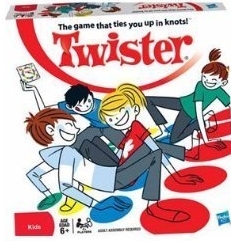 Either glue the sticks together when you are finished or attach some Velcro so the child can create it over and over! Continue to sing the song learned last week to help your child learn his phone number. Also, place individual numbers (flashcards, magnetic numbers, or index cards) in the correct order to create your phone number. - This book gives examples of how your child can reach out to other children and show love - especially children of a different nationality. Also, the book includes sequential direction on how to make a few of crafts. - Do something nice for someone else to show them friendship – make a card, cookies, or visit a friend in need. Hide little beads in a large piece of play dough or putty. Using her index finger, have your child find the beads. Using her thumb is "cheating" and not working the weaker muscles.